“When Jody Vassallo had to start hand-feeding her sheep on her one-acre property at Tilba in Southern New South Wales, she wondered what it might cost on a larger scale. As a ‘foodie’, Jody appreciates where food comes from and she considered the situation of drought-affected farmers who can find themselves relying on a dwindling income source to maintain their livelihood. She decided to take steps in the direction she knew best, by producing a cookbook of farmer’s recipes and stories sprinkled with contributions from celebrity chefs. A late-night Facebook post seeking contributions and expertise for a drought-relief cookbook attracted 200 replies by morning and now the 256-page Farmer cookbook is due for release in early February. I came to the project very late when a friend asked me to help. I quickly agreed and my contributions include four stories on females: three human and one canine. The insight into their lives and recipes brings a broader brush to the project. One woman used the recipe she feeds her husband on the harvester. Another used her mother’s recipe that is now a fourth generation favourite. Written contributions offered the chance to answer questions people might have about agricultural life. 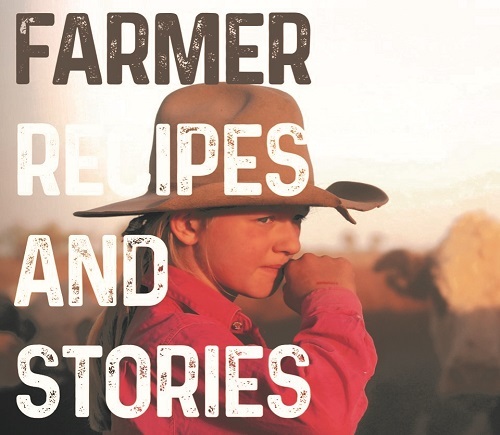 Contributors donated their stories, recipes and time for free and the cookbook has raised more than $30,000 for Rural Aid. Rural Aid directs funds to assist farming families with counselling, home repairs, hay bales, farm rescue and mental health support.